Islamic extremist militants have ruled Mali's vast northern region almost unopposed for half a year, after driving out the secular Tuareg-majority separatists who briefly declared an independent country there last spring. But everything changed last weekend, with a new rebel offensive and surprise French military intervention that have kicked the war back into full gear. Read on for a summary of events. 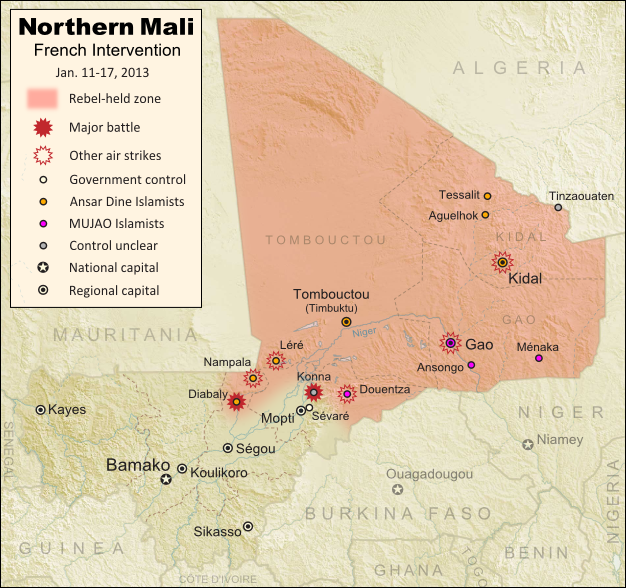 Current territorial control and fighting in Mali (including French intervention). Map by Evan Centanni, modified from Wikimedia map by Orionist, using images by Carport and NordNordWest (source). License: CC BY-SA. Map Updates: Check our Mali channel for frequent updates to this map. The closely allied Ansar Dine and MUJAO remained comfortably in control of northern Mali for the next half year. Citizens accused of immorality were brutally punished under an extreme interpretation of Islamic law, and ancient historical sites were destroyed for allegedly being un-Islamic. Meanwhile, Al Qaeda in the Islamic Maghreb (AQIM), the global terror organization's Northwest African branch, was allowed to operate freely in the region. The U.N. Security Council eventually authorized a military intervention to be led by neighboring countries, but it was not expected to begin until next September at the earliest. Everything changed last week, when Ansar Dine and MUJAO began an allied push to extend their territory southward towards Mali's capital. On Thursday, the Malian army claimed (incorrectly) to have captured the important town of Douentza from the rebels, but in fact it was soon the Islamists who had taken new territory, the small central town of Konna. Panic ensued as it appeared Sévaré, which hosts a critical military airport, and Mopti, a regional capital for central Mali, would be next. But the next day, the tables suddenly turned with the surprise arrival of hundreds of French troops (responding to a request from Mali's president). At the same time, news hit that supporting forces from neighboring West African countries would be arriving within days. Over the following night, French and Malian forces claimed to have taken Konna back from the rebels, amid a series of airstrikes against Islamist positions. However, by Monday the extremists had captured Diabaly, the nearest town yet to Mali's capital and major population centers (though perhaps not as significant as it appears); and by Tuesday, the French government was denying that its forces had even recaptured Konna. The situation in Mali is continuing to change by the hour (Diabaly is now reportedly surrounded by French and Malian troops, and there are unverified claims that Konna has finally been recaptured). Political Geography Now will be releasing frequent updates to the map as the conflict plays out. Stay tuned! (To see only posts related to this conflict, you can filter the site for all Mali articles). • The acronym "MNLA" is based on the French name, and is sometimes rendered "NMLA" to match the English. • "MUJAO" is also a French-based acronym. The English acronym is "MUJWA" (or sometimes "MOJWA"). • Ansar Dine is pronounced "an-SAR (uhd)-DEEN" and sometimes spelled "Ansar Eddine" or "Ansar ud-Dine". • AQIM is also known by its French acronym "AQMI"; its Arabic actually means "Al Qaeda in the Islamic West".